The Artist Survival Guide, organized by Brendan O'Connor, is an Urban ReThink Signature Series event recurring monthly. It aims to provide artists and the artistically curious with the building blocks needed for professional creative careers in Central Florida, and will culminate in a printed Artist’s Survival Guidebook after 12 months of programming. 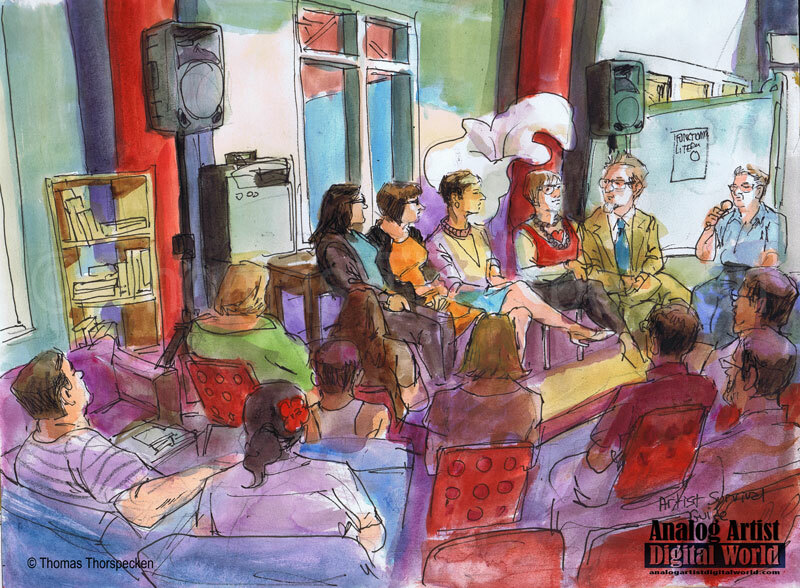 Artists art enthusiasts, and the artistically curious gathered to find out about the building blocks needed to be successful in Orlando and Central Florida. The first installment was an introduction to the Arts in Central Florida. Panelists included: Jessica Bryce Young the Arts and Culture Editor at the Orlando Weekly, Devin Dominguez the Director of Development at the Art and History Museums of Moorland, Flora Maria Garcia, President and CEO of United Arts of Central Florida, Donna Dowless, Official Ambassador of Love for the City of Orlando an accomplished local artist and art supporter, and Terry Olson, Director at Orange County Arts and Cultural Affairs, at the Maitland. Flora noted that the arts in Orlando, tend to be overshadowed by the theme park industry. Private funding isn't as high as it is in similarly sized cities. The problem is that people in Orlando come from other states so when they invest in the arts they first consider their home state or city. People come and go from Orlando in a constant stream. Donna insisted artists need a stiff spine. If a creative idea is shot down, the artist should realize that "No" is just the first step. Keep asking and pitching ideas until "Yes" is the answer. Jessica noted that since Orlando is a smaller city, it is much easier for an individual artist to make a difference. Terry briefly spoke about a program that Cole NeSmith started that brought the arts to the streets of Orlando every day for a week. Devin restated something Andrew Spears had told her, that an artist needs to be creative daily. Donna pointed out that one thing most artists need, and some never find, is a "voice" that permeates all of their work. The gallery scene in Orlando still is a mystery to me. Most paintings I see are on the walls of bars and restaurants. I've read of instances where patrons have censored and stolen art on restaurant walls. It amazes me that artists pay to exhibit their work at City Arts Factory. Donna said that the cost to exhibit art work used to be much higher.